Pickled hot peppers are one of those foods that fill a small hole in my heart. I first had Mr. Adolfi's pickled peppers in a dorm kitchen at culinary school. In a harsh Vermont winter with mediocre cafeteria food, they were a cool, spicy hot reprieve. They were unfamiliar and bold, daring me to change my thinking of both pickles and peppers. They went on crackers, in grilled cheese, and on forks straight from the fridge. On my second internship from school, Mr. Adolfi's peppers made their way to Atlanta with me. They become comforting in an unfamiliar city where I knew one other person, who came along with the peppers. Atlanta is where I discovered their versatility and learned that the vinegar from the peppers was as powerful as the peppers themselves. That vinegar went into marinades, salad dressings, deglazed pans, and made collard greens sing. 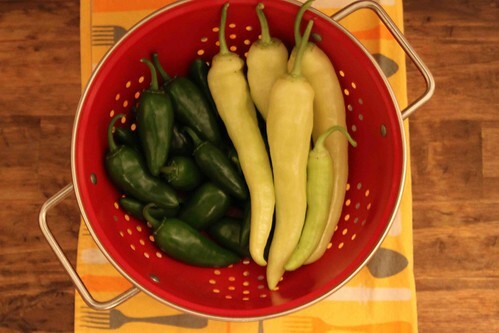 It wasn't long before I needed more peppers and I needed to entice Mr. Adolfi to supply me with more. Occasionally they came with him on a business trip or snuck home from a holiday. I even asked once about the recipe. One year for Christmas, I created a scheme: I made hot pepper jelly as a "present" to Mr. Adolfi. I sent him 12 small jars and made 12 more for presents. The hot pepper jelly played like the peppers themselves: hot, cool, and sweet; and I told Mr. Adolfi I could only make him more jelly if I had more peppers. On his next trip to Atlanta, he brought 12 (!) huge jars! I now had a strong supply of peppers, good, because I could no longer live without them. What happens with an addiction is that it is often confused with love or comfort, when this happens it stings and scars. An addiction hurts the addict, but also the people who surround them. I never meant to harm Mr. Adolfi or take anything from him. I loved his peppers as long as I had them and I was good to them, but when I left, I only took one jar with me. Here is my adaptation, based on what I believe the recipe to be. Wash and dry the jars, lids and rings. Sanitize jars and rings in a large pot of water, along with tongs, canning funnel and ladle. 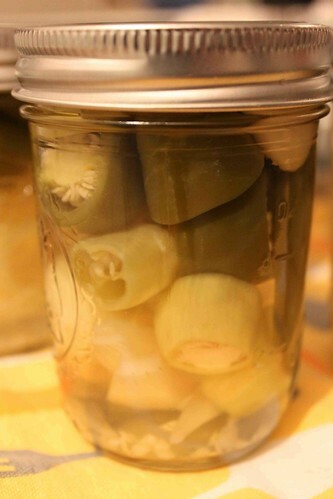 Keep jars standing by in the hot water bath and lids in warm water. Bring the vinegars, salt, and garlic to a rolling boil over medium high heat in a 4 quart pot. Remove from the pickle from the heat. Remove the jars from the water bath and carefully pack with sliced peppers - press down on the peppers as needed to remove excess space. 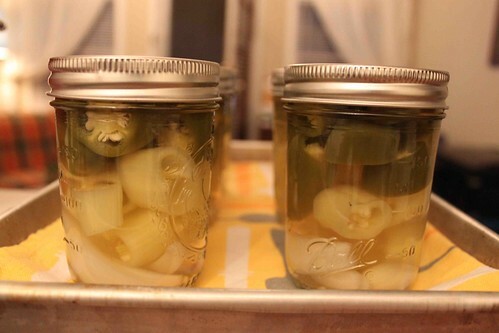 Use the canning funnel to fill the jars within a quarter inch of their rims with the hot pickle. When all the jars are filled, clean the rims with a warm clean paper towel. put on the lids and screw lids on finger tight. Process for 10 minutes in the hot water bath.